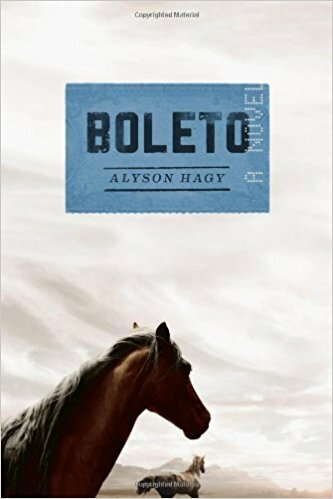 I’m not a horse fancier but after reading Alyson Hagy’s Boleto I look curiously when I glimpse a horse. The novel’s young cowboy protagonist drew me to it (I am a fancier of young cowboys). The filly he’s training for polo is the reader’s window into Will Testerman’s soul. I fell in love with the book and its Everyman protagonist, and I’m delighted Alyson Hagy let me ask a few questions about it. QUESTION: Did you intend for protagonist Will Testerman, the twenty-three year old Wyoming horse trainer, to be an exemplary human being or did he only turn out that way? ANSWER: Great question. I think he just turned out that way. All of my protagonists are flawed, and some of them are downright unlikable, but Will is committed to a certain set of values, and in the end, he sticks by them. He loses a lot—but not his heart and soul. When I began the novel, I didn’t know how it would end. Will’s skills and persistence and desire to “make it” in the California horse world led me forward. In the end, he makes moral choices I admire. Q: Will Testerman is a great name for the protagonist of Boleto. Did you perhaps choose Will’s last name because he’s tested in the novel, or perhaps because he’s a man against which all others might measure themselves? Did it occur to you that Testerman calls to mind testosterone, especial since Will oozes it off the page? A: I came across the last name Testerman (I think it was in a newspaper), and it struck me as a potentially good name for a character, so I put it in my notebook, and when I needed a last name for my young horse trainer, it seemed like a good fit. Yes, I think I knew he would be “tested,” and I think of him as a kind of turn-of-the-20th-century rural Everyman, so I liked those connections. Should I admit that testosterone never occurred to me? Will’s father and his brother Everett seem more hormone-driven to me than quiet Will. But writers miss things in their own work. It’s one of the wonders of making something and sharing it with others. Q: I’m always interested in gender, and for me gender looms huge in Boleto because Will is such a ten on the gender scale. But besides being the manly man every guy becomes in his sexual fantasies, Will is the ideal son, the ideal brother, the ideal hired man, the ideal supervisor, so in Will we have a masculine character behaving in the exemplary role often reserved for women in modern fiction, especially in modern women’s fiction where the woman protagonist is often pitted against a man behaving badly. What inspired you to give us Will? A: The honest answer is that my inspiration for Will is a real person, a gifted and very reserved young horse trainer I saw work with horses only two or three times. That young man, who wore his boots and hat and tooled-leather belt in all the expected ways, was extremely intuitive and watchful and gentle—with horses and dogs, and apparently with people. A lot of men and women “pose” as cowboys—with costumes and bravado and John Wayne-inspired panache. But to work well with large animals requires other skills, and to be gifted at it requires skills we might typically think of as feminine. 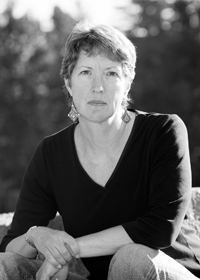 Another writer I know says that animal husbandry might more properly be called animal wifery in the West. I do like that idea. And I had it in mind as I thought of Will. I also have two brothers and a husband and a son, so I’ve experienced many gradations of gender. Did I get it right with Will? I want him to be believable—as complex and perhaps contradictory as we all are. Q: Argentines fair badly in Boleto. Did you write with purpose, because polo’s role in Argentina is especially classist, given the country’s never ending economic woes, or is the Argentine subtext simply necessary to set up Will’s test? A: I probably kept the Argentines fairly “flat” as characters because that was helpful to the plot. It also echoed my very limited exposure to Argentines; polo folks (in all cultures) are class-oriented. Another version of the novel would have given them more time on the page and made them more complex. I tried doing that in early drafts and just didn’t get very far. The men who ride the polo ponies with Will tease him and respect him. They are decent. But Don Enrique and his inner circle want what they want. Also, grooms are treated poorly in lots of places. I did want to lift the curtain on that issue, even though Argentines are probably no worse than others when it comes to the exploitation of workers. Q: A wife of Will might complain that he’s remote, and in some future novel with someone else’s Will in it, we might see a Will morphed into modern fiction’s husband who doesn’t share enough, in his wife’s opinion. Will’s mother, talking about her own marriage, even warns Will that silence isn’t necessarily better than conflict. Elsewhere in the book Will says he’ll never marry. Saying good-bye to a woman he apparently dated and hasn’t seen recently, Will finds that she wants to pleasure him and seems to require nothing more than that he stand in her mud room and let her do it. At twenty-three, when we see him, is Will more advanced in his ability to relate to horses than to women? A: Yes. He’s young—and in some ways very young. He’s focused on what he loves and what he’s good at doing, which is training rough gems like the filly. And he finds that fulfilling for now. But an older Will would probably face some emotional challenges as a lover, spouse, and parent. (People often claim they won’t marry and then do, so even I don’t know if marriage is in the cards for him.) I don’t know if I will write another novel about Will. I’ve thought about it. And he’s appeared in two short stories I’ve written. His mother’s illness has matured him, but as the novel ends, that illness has returned. What faces him when he returns home? And how will he handle it? We don’t know. I don’t know. But I don’t see his character fully set yet. I guess, as a writer, I think our characters are always evolving and changing. Thank you, Alyson Hagy. To my mind, you got Will Testerman just right: believable, capable of fault, yet as admirable as a developing young person can possibly be–and that he is a work-in-progress, as a human being, is clearly evident. I wish you could people the whole world with your Will Testermans. What a better planet it would be.